Math PuzzleHOW MANY chloroplasts could a pine tree pack into an extra 9 mm of needle? 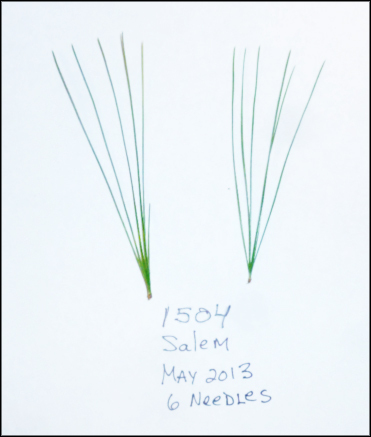 White pine needles in 2012, according to student measurements of 7,600 needles, averaged a record 83 mm in length. That’s 9 mm over the Forest Watch 22-year average! We wonder if our white pines are compensating for losing a lot of needles in 2010 and 2011—all of their third year and most of their second-year needles. When a tree loses two-thirds of its sugar-making power, what’s a resilient pine to do? Make longer new needles! David Lawlor is a photosynthesis expert. In his book, Photosynthesis, Dr. Lawlor estimates that a square meter of leaf might contain 7x10^9 mesophyll cells. How many mesophyll cells is that? 7,000,000,000 mesophyll cells in one square meter of leaf. There are 1,000,000 mm^2 in 1 m^2. So 1 mm^2 would contain 7,000 mesophyll cells. 1 chloroplast may contain 6.7 x 10^8 chlorophyll molecules! How many chlorophyll molecules is that? 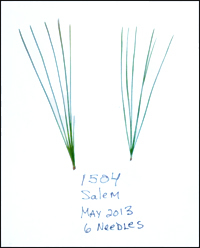 Salem High School white pine needles—with six needles on each fascicle. If the white pine lengthens its needle by 12.5%, how much more chlorophyll will it have? Needles are not the same as leaves, in mesophyll cubic space. And a pine tree will have many many needles. Design a math problem with illustrates your hypothesis. Work through to an answer and show each step. Submit your math problem to Forest Watch. Use technology to help answer the math problem and to present the problem and its answer. We’ll post it on this website. A winning math problem will be chosen by teachers at our 2014 summer workshop. Don’t forget to tell us your name, age, grade, school and your math teacher’s name and email.